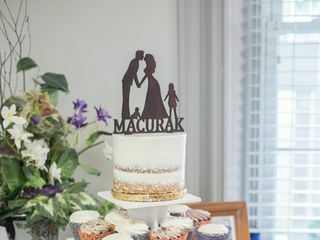 We worked with Nicole at Psycho Cupcakes for our wedding. From the time we did our initial tasting to the day of our wedding she was amazing to work with, not to mention her baking skills are superb! The cupcakes tasted great, were decorated beautifully and everyone loved them (my mother-in-law took home a whole plate for herself!). Thank you so much for all your hard work! We so appreciate it! Fantastic cupcakes! Great price. Beautiful display. Psycho Cupcakes was a dream to work with, my cake was absolutely perfect, exactly what I had pictured in my brain!! No issues. Only issue was on my end. I wasn't there while you were setting up, obviously, so I wasn't able to give you my deposit for the stands. My regrets, completely overlooked that detail. Anyone of my guests would have came to me to get a check if you had asked. But you were very forgiving and understanding and I appreciate that. Everything was great! Nicole was amazing! Although she was experiencing a family emergency at the time she could have cancelled, but she didn’t! Her service was spectacular and everyone LOVED the cupcakes! The caramel filled ones were the best hit! 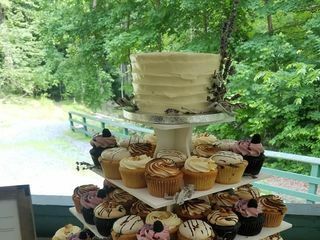 Psycho Cupcakes did a phenomenal job at my wedding! Everyone loved the cupcakes and guests STILL talk about the personalized cookie favors. Great customer service and attention to detail! Thank you!! Nicole did an AMAZING job making our wedding cake and cupcakes. I sent her a picture of the wedding cake that we wanted and the cake that she made was perfect!! Not only was it appealing to the eye, it was very delicious! I will definitely be using Nicole’s cake services in the future! We had a wonderful experience with Nicole. Our guests raved about our cupcakes, especially the Black Betty. Her gluten free cake was also amazing. Nicole was great! The quality of the cupcakes was superb and the design that asked for was done perfectly! My only complaint is that I had only one!! I sent Nicole a few different cake flavors for our wedding cake. They were better then I even expected them to be. I highly recommend her for any of your cake needs! The cake was beautiful, delicious, and she delivered and set up the entire thing for us! 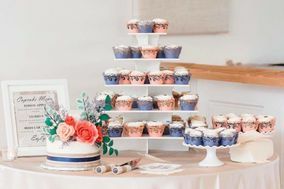 From our fun family cupcake tasting to hassle-free wedding day delivery to Nicole's patience with the return of cake stands, we had such a good experience. And that's before talking about how delicious and beautiful her cakes are! We chose 5 types of cupcakes for guests so people would have a choice and their own cake. These were a big hit. We also had a small cake of another flavor made for ourselves--just in case we missed out during the event. Due to circumstances we never got to eat it during the wedding weekend. A week later that refrigerated cake (and a few leftover cupcakes) were still absolutely moist and delicious! Friends we shared with couldn't believe it. My sister also ordered our mom's birthday cake from Psycho Cupcakes for a surprise party around the same time--entirely different flavors, size and occasion but still a magnificent cake! Go visit Nicole and plan your event. Personable, artistic, affordable, and delicious. You won't be sorry! Thanks for making our day magical! It was awesome using you as a vendor! You had great ideas and great prices! You made everything with such love and joy! Wow. OK, so first of all, her cupcakes are delicious. Second of all, HER CUPCAKES ARE DELICIOUS. I need to hammer home that point, because it is very, very accurate. Her cupcakes were so good that a bunch of our guests put them in plastic cups and took them home. Which actually bummed me out a bit but only because there were LESS LEFTOVER FOR US. Oh man, we only got to have about 6 or 7 to take home. I could have eaten a million of them. Her cake is so moist and flavorful and the frostings.....her Italian butter cream so -light- and delicate! It doesn't leave that greasy feeling in your mouth like some buttercreams do and it isn't granular like some other frostings. It is perfection. She also makes a mean cream cheese icing. Working with Nicole was truly a relaxing experience! She was so flexible when we decided a few months before the wedding to have a joint ceremony and worked with us to make sure we had plenty of cupcakes. She was also super accommodating with my sister's gluten free diet! Our recent wedding had around 230 cupcakes from Psycho for ~130 guests and not surprisingly very few cupcakes were left at the end of the wedding, which speaks volumes about their quality and taste! Nicole was very helpful in selecting flavors and making a small naked cake for us to fit our cupcake stand. We also appreciated her professionalism at our initial tasting event. Thanks so much for making our wedding perfect! Our wedding cake looked lovely and tasted delicious (particularly the cream cheese icing). 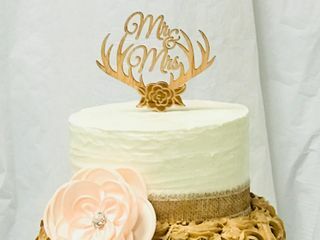 Even though Nicole was headed out of town, she fit in our somewhat last minute request for a wedding cake and organized a pick up time that worked for all of us. Loved the cupcakes at the store then decided Psycho Cupcakes was for us. Had a Birthday Cake done from there also that turned out Fabulous. Our Wedding Cake was more than expected and exactly what we wanted all at the same time. Wonderful service! Beautiful results, and most importantly - delicious! She even made a mini version of the cake to freeze for our one year anniversary! 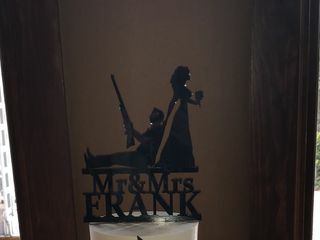 My husband first had Psycho cupcakes at a disc golf event and came home having made his first contribution to the wedding! We loved that Psycho cupcakes let us have various flavors for our guests to enjoy. They were beautiful and delicious!! After the initial booking Psycho Cupcakes as a vendor, everything was executed flawlessly with minimal effort from us. So.. I'm bad about writing reviews... and writing them on time... but this one is completely worth it. We had the cranberry zest cake and it was to die for. I have guests still tell me this was the best wedding cake they've ever tasted and I have to agree. Everything was beautifully decorated and was stunning on the table with the lights and copper decorations. My mom even had them make me a sugar skull 30th birthday cake. Seriously, go for them DO IT! Professional and personable. 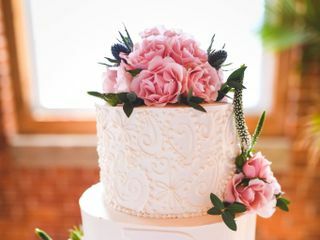 Also an absolutely beautiful and delicious cake and fun desserts for my perfect day! AND affordable. Psycho Cupcakes is perfect for your sweet tooth needs!!! 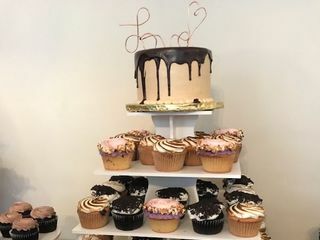 We chose Psycho Cupcakes for our wedding cake because a couple of friends had told us how delicious their cupcakes were. We checked them out and were immediately sold after a tasting! We loved working with the team and they were super affordable for the amazing quality. I highly recommend! The cake and cupcakes provided for my daughter's wedding were wonderful. Most folks took the cupcakes home since here was so much food but called or texted me later to say how moist and yummy the cupcakes were and some did not eat them for a few days. My daughter got the flavors that her and her finance wanted and everyone was happy. 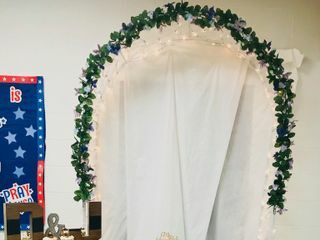 The set up was gorgeous and fit in with her theme of the wedding. Thank you for an excellent job and I would recommend you to anyone having a event.